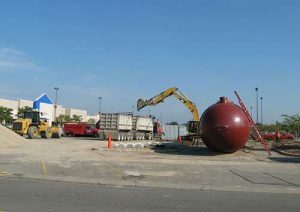 SuretyGroup.com writes surety bond for underground storage tank operators. Nationwide there are over 561,000 underground storage tanks (UST’s) that store combustible or flammable substances per the US Environmental Protection Agency. Underground storage tanks pose environmental risks due to leaking and contamination of ground water, which has the potential to affect drinking water. Because of this risk, the Storage Tank Division of the Michigan Bureau of Fire Services, requires business owners of service stations and convenience stores and other non-marketers to have a permit to store hazardous substances. The permitting process includes submitting of site plans that must provide the proximity of nearby drinking water sources, sewer systems, power poles, road and rail ways and any other source of risk in the event of a leak. The owner/operators that utilize underground storage tanks will also need to provide diagram plans for the installation or replacement of a tank including such information as the underground depth of the tank, layout of pipes, leak detection, type of tank, spill protection and other flow control devices. Owner/operators must also go through an inspection process to ensure the safe storage of hazardous substances such as petroleum, blends of petroleum used for motor fuels, jet fuels, lubricants, petroleum solvents and other mixtures of petroleum. In addition to petroleum, a list of chemicals found in Section 1121 of Part A of Title I of the Clean Air Act, Chapter 360, 84 Stat. 1685, 42 U.S.C. 7412 are included as hazardous substances that must also be monitored for safety. Owner/operators must report any leaks or suspected leaks within 24 hours. Tanks can corrode over a period of time or develop a leak by other means, and owner/operators are responsible for reporting these events. The leak event report will need to be updated within 14 work days as to the outcome of the leak, if it was resolved, how it was resolved, etc. In the worst case, the state may impose corrective measures so the event is not repeated. As a measure of safety, the Division requires a form of proof of financial responsibility which must be provided by the owner/operators of businesses that have underground storage tanks. The financial responsibility is an assurance that in the event of a corrective action by the Division, or for compensation to a third party for bodily injury, or property damage as a result of a leak, that there is a financial means to cover the event. The financial responsibility can be in the form of a surety bond, letter of credit, trust fund, self-insurance, insurance or any other form of guarantee acceptable to the state. If a surety bond is chosen as the form of financial responsibility used, both owners and tenants must both be registered with LARA and both may be required to be named in the bond depending on the terms of the lease agreement or contract of the property. LARA will determine who is to be named on the surety bond. Keeping the environment and human health safe is not an easy task, and the regulations and statutes put into place by the state of Michigan and the US Environmental Protection Agency are there for a reason. As a result, underground storage tanks will continue to be monitored for safety, and through these measures, our drinking water and underground waters will be kept safe.